I was standing in front of Cipriany Downtow in Soho, NY when i first saw this beauty. My friend and I couldn't help starring at the handsome guy passing by driving a super cool bike. She said: "Thats Lorenzo Martone"! I asked if it was the same Lorenzo that used to date Marc Jacobs, and it was! I remembered hearing that he is now designing bikes, and suddenly everything came together. 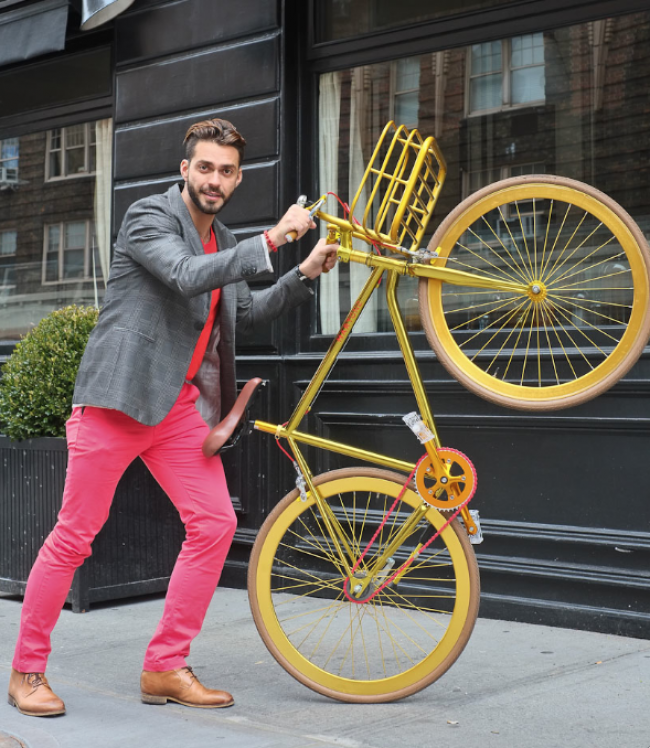 I read at Refinery 29, months ago about MARTONE CYCLING CO. These are the most fashionable bikes I've seen in the market, they are definitely a statement luxury sports item. In that same week, I went to the Hamptonsfor a shoot, and voilà; I was given a Martone bike to paddle in style. The red color is definitely my favorite, but I wouldn't mind having the gold as well. How much for this stylish investment? $899 (: What color would you get! ?